Wärtsilä’s gift to Finland for the country’s 100th anniversary involves a unique sustainability innovation raising awareness of the plight of the world’s oceans. In 2017, Finland celebrated its 100th year as an independent nation. Commemoration of this anniversary took many forms across the country, from New Year’s Day throughout the entire year to the official Finnish Independence Day celebrations in December. As part of the festivities, Finland’s largest companies set about providing the country with a range of momentous and symbolic gifts, and Wärtsilä was no exception. Having selected the centennial theme of ‘The future of the seas’ as one that captured the company’s key priorities of technology, the environment and digitalisation, Wärtsilä began a long-term cooperation with the Seabin Project, sponsoring both the city and port of Helsinki’s involvement with the programme. The Wärtsilä – Seabin partnership aims at dynamic and versatile actions using Wärtsilä’s experience, established technologies, and know-how in environmental product development. This initiative hinges on a unique innovation that has captured the public’s imagination, and drawn much welcome attention to one of the most important environmental issues currently faced. The Seabin is a floating rubbish bin that sits in the water at marinas, docks, yacht clubs and commercial ports, where it collects all floating rubbish. Water is sucked in from the surface and passed through the catch bag inside the Seabin. The water is then pumped back into the marina, leaving litter and debris trapped in the catch bag to be disposed of properly. The Seabin also has the potential to collect some of the floating oils and pollutants in the water. The Seabin Project's team currently uses 12-volt submersible water pumps that can utilise alternative and clean energy sources. These may include solar, wave or wind power, depending on the location and available technology. As a Global Pilot Partner for the initiative, Wärtsilä was among the first to have Seabins put into operation, purchasing and installing units in the ports of Helsinki, Turku and Vaasa. Wärtsilä is taking responsibility for the future of the marine environment, and we are honoured to be involved in the Seabin project. 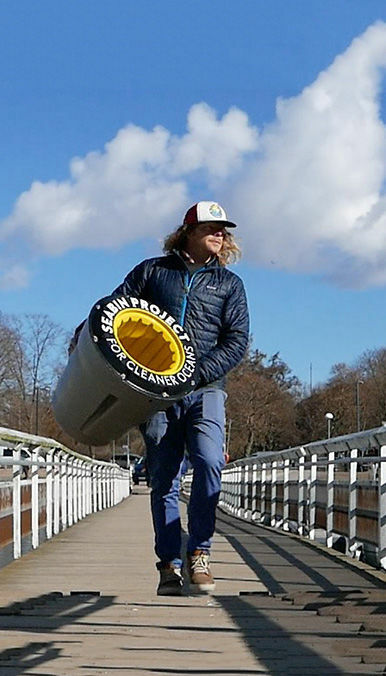 The Wärtsilä – Seabin partnership became one of the biggest centennial stories in the Finnish media, largely thanks to the project’s promotional appearances at several key events throughout the year. These included the Boat exhibition at Helsinki’s Messukeskus Expo and Convention Centre, the Tall Ship’s Race in Turku, and the annual Baltic Herring Market in Helsinki. These events not only communicate the idea behind the Seabin, but more importantly, helped to raise awareness of the environmental issues facing the world’s oceans. The events also helped to familiarise the Finnish public with Wärtsilä’s operations, its aims and, of course, what the company actually does. Furthermore, they highlighted Wärtsilä’s proven environmental products, such as systems for ballast water, wastewater treatment management, and exhaust gas cleaning. "Wärtsilä is taking responsibility for the future of the marine environment, and we are honoured to be involved in the Seabin project,” says Atte Palomäki, Wärtsilä’s Executive Vice President, Communications & Branding. “As one of the leading solution providers in the marine industry, we are constantly developing new environmental technology, such as using plastics as fuel, which we are currently testing. However, the most important thing to remember is that every one of us can do our bit for the cleanliness of the marine environment." 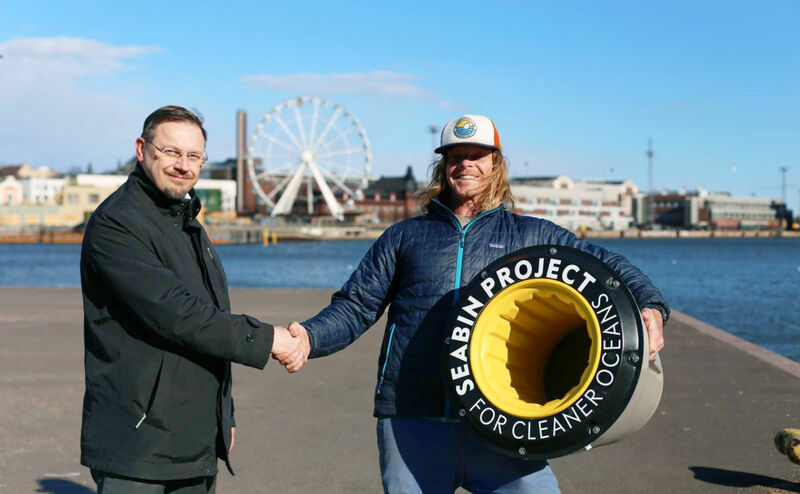 Following the success of the Wärtsilä – Seabin partnership in 2017, the project looks set to reach new heights beyond the centennial year with the installation of Seabins at several Wärtsilä’s locations outside Finland. The company will also work in cooperation with the Seabin Project for the next three years, offering its expertise in Nordic marinas and product development know-how to ensure the project’s future success.